This easy recipe for homemade cooked eggnog is sure to be the star of your holidays drinks this Christmas season. Your family and friends will be delighted with its creaminess and classic nutmeg flavor! This post was originally published on November 30, 2017. As a child, I remember drinking store-bought eggnog at Christmastime. I would only have a little bit, since I wasn’t sure if I liked it or not! 😉 But this recipe for cooked eggnog will convince even hesitant tasters (like my two younger sisters) that eggnog is one of the best Christmas beverages. Best of all, this recipe takes only 6 ingredients and less than half an hour of prep time. Plus, the egg yolks are cooked in the custard, so don’t worry about any foodborne illnesses from raw eggs. Actually, this eggnog recipe is crème anglaise, a pourable custard usually served with French and English desserts, like floating islands. The difference is that eggnog is flavored with nutmeg, which isn’t traditional in crème anglaise. Who knew that cooked eggnog is actually custard? 😋 Since it’s so rich and creamy, you’ll only need a small glass, but if you take seconds, I won’t blame you. Food historians believe that this creamy holiday drink has its origins in medieval England, based on the posset (a creamy drink). Eventually, the drink came over the American colonies, where it grew in popularity and has remained a perennial favorite. Traditionally, eggnog is made from raw egg whites and egg yolks, milk, cream, sugar, and spices like vanilla, cinnamon, and nutmeg. Many people added alcohol as a flavoring and preservative. I’ve made my nonalcoholic version with cooked egg yolks, milk, cream, sugar, vanilla, and nutmeg. How do you make cooked eggnog? Measure out the ingredients: milk, cream, egg yolks, sugar, vanilla, and nutmeg. Pour the milk and cream into a heavy based saucepan and heat until steamy, but not yet simmering. While the milk mixture is heating, whisk together the egg yolks and sugar until the mixture falls in a thick ribbon from the beaters. Gradually pour the hot milk mixture into the whisked egg yolks, being sure to whisk the whole time. Pour the custard back into the pan and cook over low heat, whisking constantly, until the mixture coats the back of a spoon. You can tell if it coats the back of the spoon by dipping a wooden spoon into the custard and swiping your finger across it. The trail should hold its shape, like in the photo below. If not, cook a minute longer and check again. Whisk the vanilla extract and ground nutmeg into the custard, then chill until ready to serve. Pour into glasses and garnish with more ground nutmeg. Enjoy! You need to make this recipe! It’s super simple, and so delicious you won’t want to buy store bought eggnog this Christmas. Go ahead–make a double batch! These other festive drinks will have you coming back for a refill. Cranberry Apple Cider Mocktail: this fun festive mocktail packs a punch with tart cranberries and sweet apple cider. 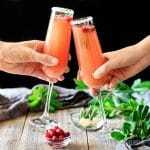 Sparkling Cranberry Mocktail: five simple ingredients is all it takes for this beautiful and tasty Christmas drink. Candy Cane Mocktail: this sophisticated drink combines the lovely flavors of strawberry and cranberry. Did you make this homemade cooked eggnog? Please leave a star rating below the recipe to share how you enjoyed it. Pour the milk and cream into a heavy-based saucepan. Heat it until quite hot and steamy, but not simmering. Meanwhile, blend the egg yolks and caster sugar together with a hand-held electric mixer until the mixture is pale yellow and falls from the whisk in a thick ribbon. Gradually pour the steaming milk into the egg mixture, whisking the whole time. Pour the custard back into the saucepan and set over low heat. Bring it up to 170-175 F on a candy thermometer, whisking frequently. To test the custard, dip the back of a wooden spoon into the custard. Swipe a finger across the spoon. If the line holds its shape, the custard is done, but if it doesn’t, cook a little longer. Don’t bring the custard above 180 F, though, or it may turn into scrambled eggs! Remove the pan from the heat and stir in the vanilla extract and nutmeg. Pour the custard into a bowl and set it inside of another bowl filled with ice water to cool, stirring occasionally. Chill the eggnog in the fridge until ready to serve. Pour into glasses and serve chilled with a sprinkle of nutmeg on top of each glass. Don’t add extra nutmeg or vanilla while the eggnog is still hot; the flavors will grow a little stronger as the eggnog cools. The eggnog can keep in the fridge for up to 1 week. The cholesterol in the eggnog is mostly from the egg yolks and cream.